Quickly dissolves grease and eliminates build-up. General cleaning and degreasing — food handling areas, greasy equipment, floors, walls, and open sinks. Industrial sewage controllant — municipal sewage plants, pumping stations, and industrial plants. The solvent can also be used to clean walls, quarry tile, greasy kitchen floors, and almost anywhere that grease is a problem. After cleaning, pour mop solution down the drain for an economical drain maintainer! BIONET GOLD meets the requirements for use in federally inspected meat and poultry plants. 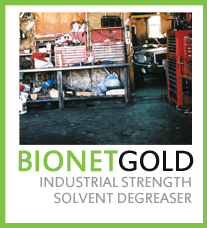 BIONET GOLD’s naturally derived soybeanbased solvent dissolves grease safely and effectively and eliminates build-up. It is fragrance-free, dye-free, and biodegradable. It degrades at the same rate as dextrose (a sugar). BIONET GOLD has no explosive blowbacks and won’t burn the skin. It causes less skin irritation than a 4% soap and water solution. Now that’s mild! BIONET GOLD is safer to handle than caustics or acids. It is nearly 10 times less toxic than common table salt (sodium chloride). General cleaning and degreasing — Dilute 4 ounces of BIONET GOLD to one gallon of warm water. For effective results, apply generously to greasy equipment, floors, or walls with mop, sponge, or cloth. Allow to set approximately 5 minutes. Rinse with clean water. Not for use on synthetic or resilient tile floors. Carpet spot and spill removal — For spotting, dampen a clean, white cloth with BIONET GOLD and rub gently, working from the outside of the spot toward the center. Change the cleaning cloth when it becomes soiled. For gum removal, use a dull knife to remove large particles. Then saturate a clean cloth with BIONET GOLD and rub. Note: Use caution around plastics and avoid prolonged contact with solventglued joints in PVC pipes. Avoid prolonged contact with paint. Concrete floors may be stained and/or pitted if prolonged contact occurs. upward for peak periods of flow.